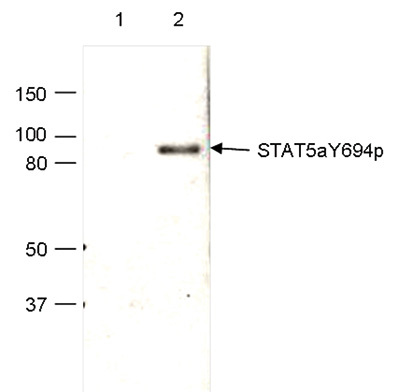 Add STAT5aY694p polyclonal antibody - Classic to my shopping cart. Request a quote for a bulk order for STAT5aY694p polyclonal antibody - Classic. Please fill out the form here below. Your local sales account manager will get in touch with you shortly and send you a quotation based on your requirements. 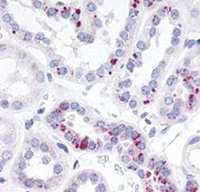 Polyclonal antibody raised in rabbit against mouse STAT5a (Signal Transducer And Activator Of Transcription 5A) phosphorylated at Tyr694 using a KLH conjugated synthetic peptide. Lysates from NK92 cells treated with IL-2 (lane 2) or untreated control cells (lane 1) were analysed by Western blot using the Diagenode antibody against STAT5aY694p (Cat. No. C15410329) diluted 1:1,000. The position of the phosphorylated STAT5a is indicated on the right, the marker (in kDa) is shown on the left. The antibody recognizes the phopsphorylated STAT5a but does not react with the unphosphorylated protein. Formalin fixed paraffin embedded human kidney tissue was stained with the Diagenode antibody against STAT5aY694p (Cat. No. C15410329) diluted 1:50, followed by a peroxidase labelled anti-rabbit antibody. STAT5a (UniProt/Swiss-Prot entry P42229) is a member of the STAT family of transcription factors. These transcription factors are activated by phosphorylation in response to cytokines and other growth factors. Once phosphorylated the proteins are translocated from the cytoplasm to the nucleus were they activate there target genes. As such STAT proteins act as both signal transducers and transcriptional activators. STAT5 regulates the expression of milk proteins during lactation Further, STAT5 is associated with different tumors and activation of STAT5 in myeloma and lymphoma has been shown to be essential for tumorigenesis. Diagenode strongly recommends using this:	STAT5aY694p polyclonal antibody - Classic (Diagenode Cat# C15410329 Lot# 001). Click here to copy to clipboard.